What is the Kumbh Mela? The Kumbh Mela – literally translated to mean “khumba fair or festival” – has been described as “the world’s biggest gathering of humanity”. Over seven weeks (between 15 January and 4 March) more than 120 million people are expected to converge on the banks of the confluence of the three rivers. In comparison, Islam’s ‘Hajj’ pilgrimage to Saudi Arabia drew about 2.4 million in 2018. An average of two million are expected to take a dip in the water every day during the Kumbh Mela, and this may rise to about 30 million on 4 February (the high point of the festival). 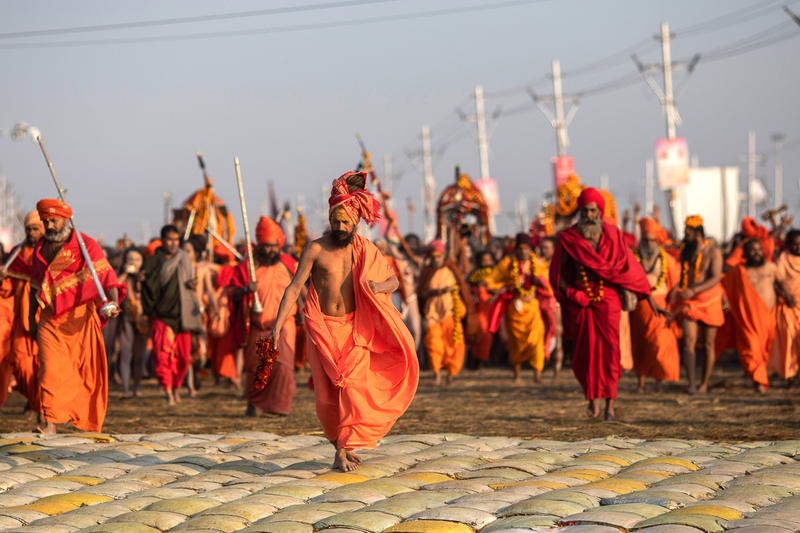 Traditionally, there are four Kumbh Mela festivals held at four different sites over a cycle of 12 years, with the date, length and location determined by astrology. There are various legends and stories linked to the origin of the festival, which was first mentioned in a written record in 644AD – a common thread among the legends is that a god spilled some drops of an immortality nectar from a pot (a “kumbh”) at four locations, which correspond to the different sites where the melas are held. As well as cleansing sin and ending the cycle of life and death, it is believed that bathing in the sacred rivers can cure illnesses and remove obstacles from one’s life. In addition to the ritual bathing, Kumbh Melas involve processions of different sects (especially the sadhus – ‘holy men’), religious discussions, doctrinal debates, devotional singing, and seeking guidance from the sadhus about spirituality. Geeta Pandey of BBC News writes that the atmosphere is festive, and there are scheduled music and dance performances as well as impromptu entertainments. Historically, the immense number of people gathering in one place has caused some problems – notably, outbreaks of cholera and other pandemics, deadly stampedes (the worst happened in 1954, when 800 people died), and sectarian clashes that sometimes turned violent (it is believed that approximately 12,000 people were killed in clashes in 1789, due to disputes about the bathing order). In more recent years, attempts by the government have been made to improve sanitation, to manage the flow of the crowds and to establish set bathing orders. For the 2019 festival, a temporary ‘tent city’ has been set up (with accommodation ranging from simple dormitory-style beds to 5-star quarters). An extra 800 trains were made available, hundreds of new roads were built, artificially intelligent video surveillance and analytics were arranged by IBM, disease surveillance was planned, 15 lost-and-found camps were set up and a smartphone app was designed to help visitors. According to Casey Quackenbush of TIME Magazine, the estimated budget for the whole event was the equivalent of about $400 million. It is also reported that for crowd management purposes, pilgrims may only bathe in the river for 41 seconds each. Beyond the religious focus of the Kumbh Mela, there is also political manoeuvring – critics of the government are pointing out that an unusual amount of money has been spent on the festival this year, which so happens to be an election year. According to another report, the government has spent more than $620 million, which is more than triple what was spent on the same event in 2013. Pandey of BBC News reports that there are massive billboards in the festival area featuring pictures of Indian prime minister Narendra Modi, as well as huge cardboard cut-outs of him in strategic bathing areas. Zeenat Sabarin, writing for Aljazeera, says that Mr Modi’s popularity has dropped in the past months, and the ruling party has been making concerted efforts to rebuild its ‘Hindu nationalist’ base in Uttar Pradesh (India’s most populous state, which includes the site of this year’s Kumbh Mela). Ahead of the gathering, the city’s name was changed from “Allahabad”, which has Muslim tones, to the more Hindu name of “Prayagraj”. This is in line with the growth of fervent Hindu nationalism in recent years, which discounts the rights and position of non-Hindu minority groups in the country. The fact that so many millions of people are acknowledging the need for cleansing of sin is a confirmation of the ongoing need for the sharing of the Gospel message wherever possible. It is believed that India is home to more than 2,500 ‘unreached people groups’, and while there are many Christian missionaries working in India, there is so much more to be done. There have been mission outreaches at the Kumbh Melas in the past, and a missionary who worked in India for a number of years says that the indigenous Church is very aware of the spiritual implications of the mela and the “lies” that it represents. However, there is also a tendency for Indian Christians to avoid the melas in order to keep a distance from the “world”. A few years ago, it was reported that hard-line Hindus were intending to use the Kumbh Mela as a means of drawing Christian converts back to Hinduism. Outside India’s borders, very few Christians around the world know about the Kumbh Mela, which points to a need for increased awareness that can lead to increased involvement. A question that needs to be asked is whether the global Church is as earnest in prayer for the Hindu world as it is for the Muslim world – because Hinduism seldom seems to affect Christians in the West as closely as Islam does, it calls for effort on behalf of the Church to commit to sustained prayer for so many millions of people.